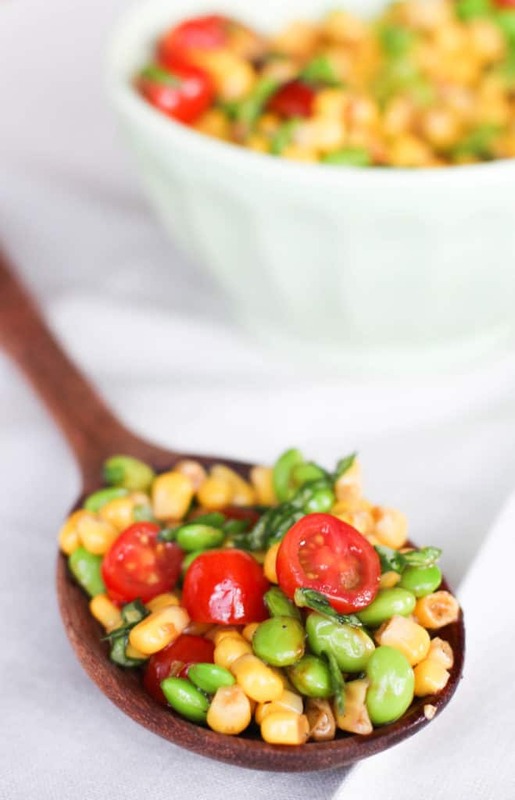 This Corn Edamame Salad with Balsamic Vinaigrette is perfect for a quick and light side dish. It’s so easy to throw together in a bowl and mix up for a snack or dish for dinner. Another option is to throw it on a salad with some grilled chicken like I did with these leftovers for a great dinner! A super easy way to please even the pickiest of eaters. 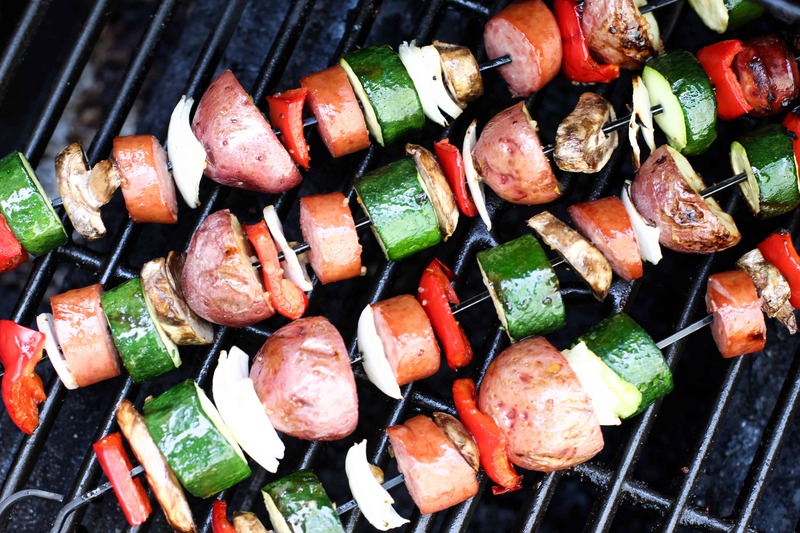 I cannot wait to make this once all of the produce is fresh this summer. I’m imagining adding even more fresh herbs or veggies straight from the garden. ??? The lime juice helps cut the vinegar flavors keeping it very light. You could also cut the balsamic vinegar all together and replace it with lime juice. 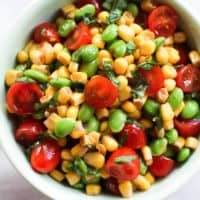 Maybe replace the basil with cilantro and add some jalapeños and red onion you’ve got a fun southwestern take on this salad! There is something about the brightness of the vegetables alone that makes this so fun to eat and reminds me so much of summertime. Until summer actually arrives, I’ll happily take this little bowl of sunshine. I also wanted to let you guys know that The Culinary Compass is on Yummly! 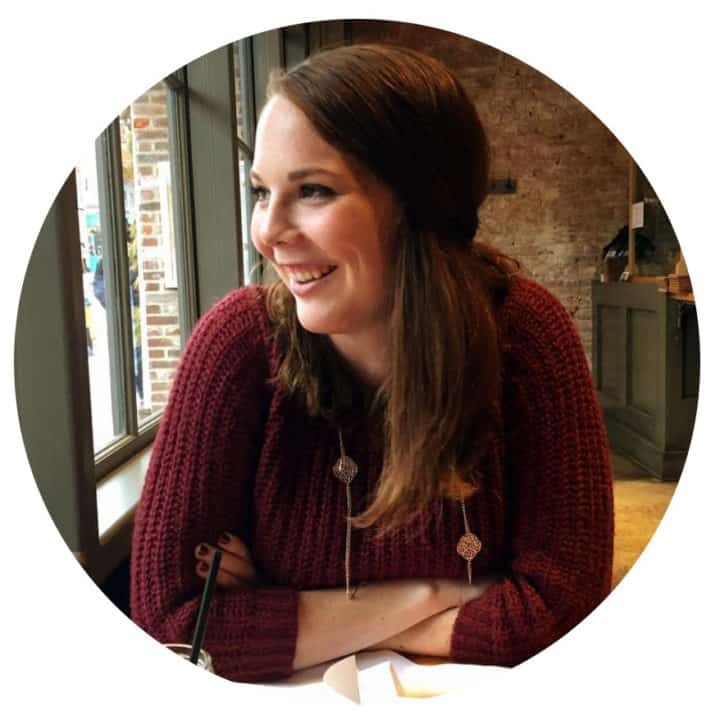 Head over here to check out my page that compiles all of my recipes that are Yummed! If you haven’t already, you should download the Yum bookmarklet that allows you to Yum recipes straight from the browser. My Yum button is up by the title of the post which will add it directly to your Recipe Box! It’s so easy and there’s tons of recipes you can search on their website. 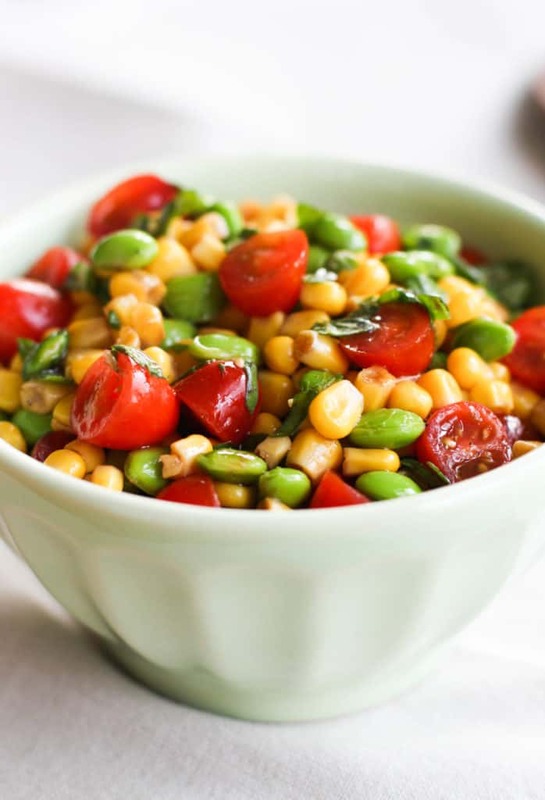 A light and easy side dish to eat on it's own or on top of a salad. 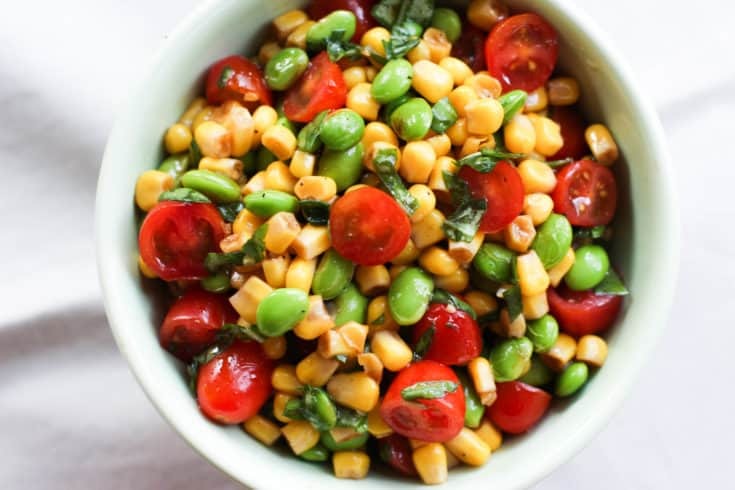 Combine corn, edamame, tomatoes, and basil in a bowl. 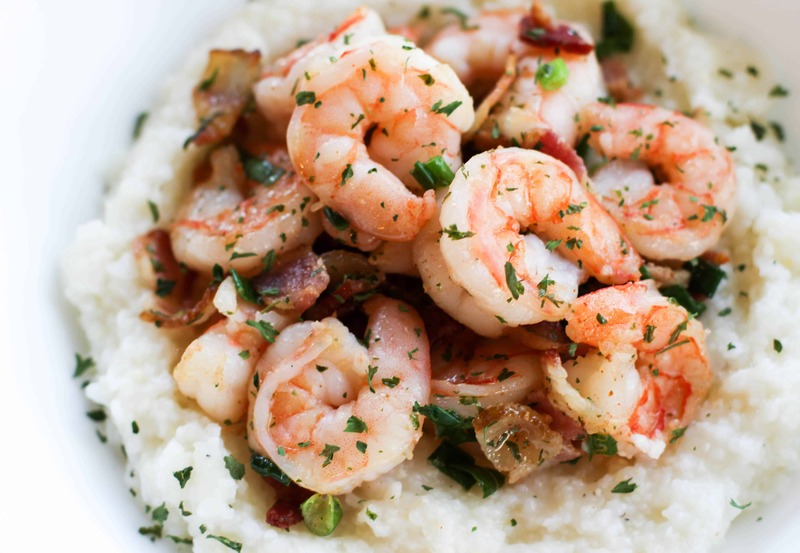 Combine olive oil, balsamic vinegar, salt, pepper, and lime juice in small bowl and mix well. Pour balsamic mixture over corn mixture and mix until everything is incorporated.